I’d like to address all my friends who shoot bullseye pistol. The past eight months have had several pivotal moments unique to our sport. From this past July to the present, the Competitions Division of the NRA has attempted several major initiatives, for the sport and the National Matches. Some of which perplexed a large portion of our community. It’s unclear what the NRA’s goals have been over the past few months. What arrived in the wake of their initiatives generated what many perceived as little more than machinations on the part of the Association. Unintentional intrigue or possibly careless execution from our governing body has caused many competitors to express their outrage and lack of confidence. Those concerns were openly made in public media, such as the Bullseye-L Forum and Facebook. It has reminded many of us something we all suspected for a long time: Declining participation is far worse than most of us would have expected. As such, these circumstances place our sport in peril. It’s rich history and traditions could potentially be severely damaged or lost. I and several others, who have great respect for our sport, have taken the position the NRA needs feedback and guidance from the competitors. Currently there is no such process or mechanism in place. Keep in mind I’m not referring to individual communications, but one that is collective. I’m suggesting that we organize a committee that would represent the desires and interests of our community in the form of a single voice directed at the Association. I believe that we as competitors can assist the Association in overcoming some of these ongoing issues. In essence, I think it would be wise for us to have our representation based upon regional areas of the country. The following individuals have graciously volunteered to help represent us: Phil Hemphill will represent the Deep South; Brian Zins will represent the Mid-West; Rob Kovach for the Great Lakes Region; Frank Greco and me for the Mid-Atlantic; and John Zurek for the South West. Additional volunteers for committee members are needed to represent the Mountain States, West Coast and New England regions. Committee members will be required to reach out to local bullseye shooters to determine their temperament on various issues that relate to the sport. They may be called upon from time to time, to meet with officials of the NRA. And as well, the committee might reach out to the shooting community for assistance in advancing the community’s goals and desires. The primary purpose of the committee is fairly obvious. Competitors are the sport, and their input for its future direction and scope should have high priority. Once the committee is adequately formed and prepared to work, routine updates will be posted on the Bullseye-L Forum. What does the NRA think of this idea? Don't we already have a pistol committee? Maybe it needs a Bullseye sub-committee. This sounds as if it has merit. There should be a mechanism for selection of the reps and defined terms for them. This is NOT to critisize these vols but a matter of organizing our representation. Further,if we select them and or they come from among the shooters it would be a better method than having the NRA select a BE sub-committee. Colt711, you bring up a good point. The more representation the better, but the truth of the matter is we need to start somewhere. Originally I gave serious thought about initially doing state representation, and at some point we might actually get there. The timeline estimates to bring most of the states up and running looked like it would take a about year or possibly two to organize them. Hopefully in the future we can build on the current framework. In this situation, time appears to be a very precious thing. 1. There are sponsors for the national matches, so I don't understand that point. I would consider the recruitment of local sponsors to be a local issue. 2. I firmly believe that the only way to recruit new bullseye shooters is on a one-to-one basis. Making the shooting public more aware of the sport might have merit. 3. Just what kind of operational support should the NRA have for registered matches? 4. Casting off the NRA from bullseye shooting is a good way to kill it, IMHO. 5. I thought that Denny stated that electronic targets was off the table, at least for the near future at Camp Perry. I'm not against having regional reps. for bullseye, but in my experience, when I have presented an issue or suggestion to the pistol committee, it has been taken under serious consideration. Having been directly involved in or actively observing the sport for over 40 years, it is my impression (excluding the military) that it's the individuals at the local club level who spark interest and participation in the sport. Sometimes it is only a couple of individuals in a club who do this. After a period of time, those members either get weary of it or are unable to continue. When someone doesn't take up the torch with enthusiasm, the program flounders. We are lucky to have Denny Willing on our side at the top, but the base (local level) needs broadening and shoring up. I can pretty much sum it up with, "Everyone wants to shoot and nobody wants to do the work." The items you pasted from my post are not original ideas or concepts from the committee. The way in which you phrased your questions almost takes them out of context. These items came from various individuals in the sport from several different venues, such as, the Bullseye-L, Facebook and this forum. It was simply a compilation of concerns gathered from the pistol community which have redundantly appeared over the past 6 to 8 months. As to your statement about “taking up the torch,” I couldn’t agree more. That will never change. The biggest part of promoting our sport will always be accomplished by the efforts of people like you and me, who encourage and attract new shooters. I’m optimistic the committee can sit down with various people who either sanction or currently promote the sport. And as such, hopefully we can come away with some practical solutions to overcome some of these problems. It is refreshing to see that we are concerned about the declining Conventional Pistol participation. Many of the issues originally presented have merit but I do not necessarily agree that we need to form more Committees to directly interact with the Divisions within the NRA. After all, don't we (the NRA membership) annually elect a Board of Directors to oversee the internal operations of the NRA and should we not present our concerns to the "Board" when a Division is not performing as expected? I personally scrutinize the resume of each and every nominee on the Annual Election Ballot and filter out the obvious BS of some ("Suits") nominees, focusing my choices on Competitive and Legislative experience. Again, each Division of the NRA has a specific responsibility to the membership and should they not be performing as required then it is OUR responsibility to hold the "Board" members accountable! When was the last time any of us attended an NRA Annual Meeting and interacted with Committees or "Board" members? The NRA has had a proud and successful history regarding the founding promotion of the the shooting sports. The NRA has been there from the infancy of the shooting sports when there was not much profit ($) in the promotion of firearms safety and proficiency, not to mention the training of Law Enforcement. Now that there is money to be made, organizations and associations promoting firearms sports are oozing out from everywhere. In my opinion, the NRA provides a vital service to the Competitive Shooting Sports by acting as an impartial Regulatory and Validation clearing-house essential to maintaining the credibility of the Competitions. Given the current and frequent assaults on our 2nd Amendment Rights it appears as though the NRA has been more focused on safeguarding our right to possess, use and yes even compete with firearms. Maybe it is time for State and Local Associations to step-up-to-the-plate and start promoting the Shooting Sports within their jurisdictions more aggressively? Instead of casting-off the NRA and forming a new governing body, why not use that energy to seek-out new and inventive ways to work within the system? Clubs and Associations could use assistance in Public Relations to advertise and promote competitions and events. Local Gun Shops and Sporting Goods Stores should be asked to advertise or participate in awards. I believe, just because the NRA Rules specify a set Awards Schedule does not mean that a local club or associations cannot extend recognition locally within those match procedures, i.e; Highest scoring competitor firing a Glock wins a Gift Certificate for NRA Online Store purchase or, Competitor having a score closest to 700 in a 900 Aggregate wins a box of ammunition from a local sporting goods store, the possibilities are endless. I should not but, I am going to stick my neck out. Electronic Targets, are probably one of the worst things that can happen to the future of any Conventional Pistol program. Conventional Pistol and Rifle competition IS NOT A SPECTATOR SPORT, it is boring for anyone other than the competitor! The joy of Conventional Pistol and Rifle competition is the interaction with other competitors of similar interest and varying expertise. Taking that 50 yard walk to score targets and argue for or against a line shot is interaction... have you ever argued with a computer? Also, meeting other shooters from across the country and mutually complaining about the weather/conditions at Camp Perry or exaggerate your personal past experiences. Electronic Targets are the precursor to firing on a computer interactive target, downloading the information to your computer and uploading to the NRA database for score compilation and award assignment, BORING. I am sure I would loose this argument with Rifle competitors due to current time loss in pit and range changes but, I would miss the interaction in the pits. 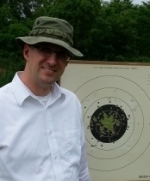 My understanding is, all Camp Perry Rifle targets will be Electronic by 2016. I shot on the rifle "thermometer Style" Electronic Target Frame on the Function Range at Camp Perry last year and I have to say it was interesting. No spotting scope needed, just look at the laptop monitor to see your shot plotted and read how many thousands of an inch you were out. Do not know if I can get used to shooting at a plain black backer in a hole in the center of a plain background surface? At the non-discounted cost of $4,000 a target, plus the cost of a firing point laptop, I believe I will be pulling pits for a few more years, at least into my mid-70's. I apologize for the extremely long post and wish all a safe and enjoyable shooting season. What has been done in other parts of the world to make International shooting more a spectator sport? Jack H wrote: What has been done in other parts of the world to make International shooting more a spectator sport? Shooting on electronic targets has increased interest to be sure. It is actually fun to be able to watch monitors and see how each shooter is doing and exciting to see the lead changes. Unfortunately, if bullseye is declining in the U.S. then International Pistol is gasping for breath. PaulB1946 hits the nail right on the head with his comments. Many of the things he said have already been discussed in the group that Tony formed and the feedback seems consistent that breaking away from NRA isn't needed for us to do more on our own, therefore it appears that the idea to break away from NRA has lost momentum. I have assurances from Denny Willing that funding for electronic targets for the Pistol National Matches are completely off the table for at least the next few years, so lets not beat that dead horse here. What I am interested in is feedback from match directors about what would make it easier for you to host more matches. If NRA isn't equipped or willing to provide what you suggest, I have been advocating for our collective group to provide that support--not by breaking away from NRA but providing what you need as a collective. That might require us to form a not-for-profit association to handle the mechanics of it but it can work. We would let NRA do what they do, then have the not-for-profit association do the other things that can help grow our sport. I'm interested in feedback from shooters to tell us what you would like to see your match directors do for you--or things they already do that you like. The group that Tony has formed needs the feedback so we know where to focus. Maybe we can get NRA to expand their service to us bullseye shooters, and even if they can't, I have ideas on how we can deliver. If we can present effective ideas that will help grow our sport, I believe our team can execute those ideas and make them work. I want to write a big thank you for those folks who already volunteered to represent the rank and file shooters around the country. Bravo and well done for taking this step. I appreciate all you are trying to do. This is a great way to build momentum and create positive change. Please reconsider focusing on e-targets as to why international is not doing very well. E targets are really not part of the problem. I've worked at a universities now for over 10 years coming out of my own business before that. Electronics are part of the last couple of generations life period. They see pencil and paper as BORING and old fashioned. Keep up the good work people. Let us rank and file folks know how we can help. I'm up for donationing to offset your travel expenses and startup costs. In the food for thought. I agree that a lot more can be done to promote the sport of Bullseye, and to encourage sponsorship. However I think it is possible that the *bullseye is dying* folks are panicking about nothing. I have been following Steve Turner's posting of all the historical Camp Perry results that people have donated, and the total number of pistol competitors at Camp Perry was 841 in 1980. So before we rush headlong into chicken little mode, trying to fix bullseye, I want to see analysis of exactly what groups we are losing competitors from. I suspect it is primarily military as the military no longer supports shooting financially as they did thirty five years ago. And the sequester, the lousy economy, and high price of gas has really mucked things up the last few years. With gas under two dollars a gallon this winter, it will be interesting to see what the attendance numbers look like this year. Schaumannk wrote: In the food for thought. I agree that a lot more can be done to promote the sport of Bullseye, and to encourage sponsorship. I'm pretty sure that the scarcity of .22 ammo and reloading components has had some impact on participation. IMHO, we will never see the huge numbers from the 50's and 60's when the military contributed a lot of support and provided competitors from all over, so the 80's participation numbers are probably a good base line. Schaumannk wrote: So before we rush headlong into chicken little mode, trying to fix bullseye, I want to see analysis of exactly what groups we are losing competitors from. Right on, but we need to know where they are coming from, age, etc..., so we can target our efforts. I've heard anecdotal info but these are data points and not enough info to act on. Without this type of info. anything we try is just throwing sh1t on the wall to see what sticks. Our club holds a free bullseye clinic every spring using 25yd targets. There is a class room session and a range session. Bullseye shooters from the club provided 1 on 1 or 1 on 2 coaching. There are at least 20-30 attendees and everyone gives the clinic high marks but we only get 1 or 2 new shooters maybe 3. So if as many clubs as possible put on at least one clinic a year we might add a few hundred new shooters every year does that keep up with what we loose? And it looks like the extremely popular Bianchi Cup 2014 had a grand total of 282 shooters. So tell me again, how bullseye is dying. I think some of the sponsors need to see these numbers. knightimac wrote: I want to write a big thank you for those folks who already volunteered to represent the rank and file shooters around the country. Thank you for your kind words. We will do our best to promote our beloved sport and to ensure it's growth. I agree, in part, with some comments that the ammo shortage played a role in limiting participation. Fortunately, we are starting to see regular inventory and availability again. I, too, enjoy the comradery of scoring and the break it offers my arm. As I've been participating in Bullseye for just over 4 years, I can not speak to participation numbers at Camp Perry before that. I've bee told the military used to send much larger teams to compete. I understand that some military branches compete in action shooting. I wonder if the branches that do compete in action have split their resources? Moreover, action shooting seems to have grown in popularity and may have attracted some shooters away from Bullseye. Of course, with every action there is a reaction. Recently, we have started to hold beginner marksmanship classes and some action shooters are attending. They have had difficulty hitting their steel targets. They enjoy slowing down and learning the fundamentals. This might be an opportunity for us as some enjoy the unique challenge of Bullseye shooting strong-hand only and have become regulars now. I would encourage all of you to continue to post your thoughts and comments. It is greatly appreciated. Schaumannk wrote: And it looks like the extremely popular Bianchi Cup 2014 had a grand total of 282 shooters. Last year pistol had 656. I've been following the subject of loss of numbers on the various threads and as discussed at the range for a while and I continue to think that for any of thes persuasions it starts at the local clubs. Any successful BE program I've seen ot heard about has either 1 leader or a small group at the center. These guys are always individuals persons enjoy being with and are willing to take time for the basic questions. These people and clubs the NRA must find a way to help. Possibly an NRA push in publicity. Identify an area which has a decent program and concentrate there to see what works. More publicity (by NRA) for (local) record holders and when records are broken. Possibly a good, user friendly computer program which will compile the necessary reports in the correct format for HQ to ease their data hadling times. Could this help lower the NRA fees for matches? Are their any ad agencies friendly to shooters, NRA, & etc. who might lead us a bit, pro bono or at a low rate? The numbers above by Schaumuk & Sixtfunda should give us plenty of encouragement. The ammo supply & price should not be taken lightly as a cause as mentioned also. Can our new committee appoach mfg's, distributors, and obtain some consideration in these area's. If our shooters support a source it might pay for both supplier & users. If we look at CMP numbers, the outlook is very different. The rifle NTI had 927 competitors. The pistol NTI had 458 competitors. The rifle P100 had 1,126 competitors. The pistol P100 had 488 competitors. The rifle matches have shooters involved for 10-12 hours. The pistol matches have shooters involved for under an hour. NRA rifle matches are glorified practices for CMP matches. The NRA pistol matches are a different beast altogether from the CMP matches. The NRA should see the CMP competitor counts as a sign that rifle matches could easily grow. Pistol will be tough sledding no matter. Some of this is true, much is not. It takes me the same twenty plus hours of driving to get to Camp Perry whether I am shooting rifle or pistol. The NRA pistol matches make really good practice for the CMP matches. Just shoot it with iron sights. One of the oft repeated fantasies is that everyone is doing action pistol, and we need to change bullseye to be more,like action pistol. Clearly, from the Bianchi Cup numbers, that just isn't true. Everything I posted is true. Perhaps, you could clarify what I wrote that was wrong. Bianchi Cup is a difficult course to duplicate. Almost no one does that event. Action pistol in these contexts should refer not to "Action Pistol" and instead refer to USPSA and IDPA. Both of those events are large and growing. DeweyHales wrote: Everything I posted is true. Perhaps, you could clarify what I wrote that was wrong. A lot of what you posted was opinion. Time it takes to shoot a match at Camp Perry has to include travel time and money to get there for any kind of valid comparison. I think the CMP has tried to respond to some of the difficulties with having the correct guns, and ammo to shoot the P100 and EIC which has to have impacted participation. Many juniors and women will now probably have an interest in shooting CMP matches because they can use 185g ammo. I made a simple comparision, NRA bullseye is doing better in terms of participation numbers than NRA action pistol. We also are doing better than NRA rifle. Therefore all the chicken little-ing about bullseye being a dying sport compared to other NRA pistol events, is just so much BS. So then why does Action Pistol seem to get the big money sponsors? Not to mention the professional shooters in the various action venues.